It’s open source, hackable and customizable device. It has a stylish look, hand made, and it Talks! Heck it will even tell you temperature inside your room. This is fully assembled clock, no soldering required! It will work out of the box (just set time and date). 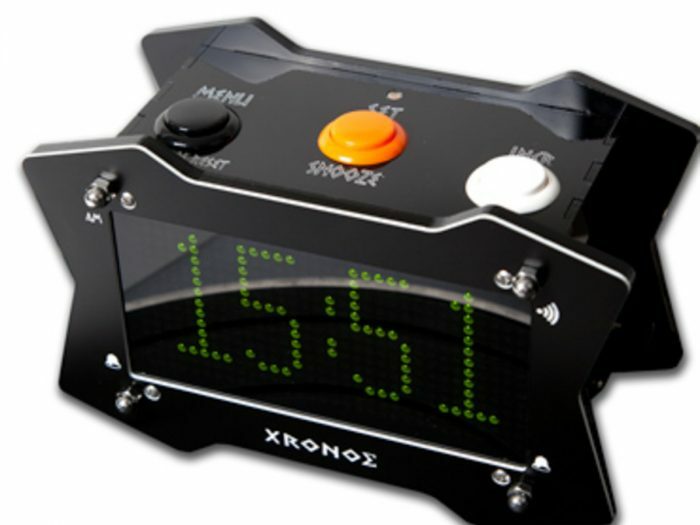 Xronos Clock is not your average Alarm clock. Dual Alarms: Alarms have both simple Daily or Weekday setting as well as a more customizable selection of days of week when. You can even choose any of 10 Alarm tones be it a buzzer, a melody or special effect such as train, thunder or police siren. Change display color to Green, RED or Orange. Xronos has internal backup battery that will allow it to keep time if you forgot to plug in … if it’s just for an hour or … for a year or two! All settings are saved to flash memory (EEPROM), so you don’t have to worry about power loss. All your alarm settings and preference will be there when power comes back on! High efficiency durable US Compatible Power Supply is included*! Since all audio files are kept on microSD card inside, you can even change alarm tones, or replace voice prompts with your own . I make Xronos clock by hand, meaning soldering, assembly of the laser cut acrylic enclosure, paint filling, etc. Thus quantity is limited. There are currently two varieties, one with yellow middle button and one with orange. Please choose which one you like during checkout! Take a look at Video of the clock in action! Please visit XronosClock.com for more information such as schematics, firmware downloads and more! Please note: Middle button color selection might not be available for special models (i.e. with RFM12b or IR remote). We will let you know if your selection is not avaiable and you will have a chance to cancel or modify your order. *Note to European customers: You will need to have an adapter to convert US Plug to Euro Plug (it’s not included).